House dust mites are the most important indoor allergen. Approximately 1-2% of the world population suffers from house dust mite allergy. The house dust mites are arachnoids, that are part of the Pyroglyphidae family. The most important house dust mites are Dermatophagoides pteronyssinus and Dermatophagoides farinae (in drier areas). Also Euroglyphus maynei belongs to the Pyroglyphidae family. Euroglyphus maynei is present in humid environments, especially where there is no liquid water to drink. The house dust mites prefer to inhabitate very warm and humid environments. Usually they are found in settings where the temperature rises above 20 degrees and humidity is above 70%. The humidity is crucial for mite’s survival because they extract the water from the air. However, as a result of their great adaptability, they are able to survive in humidity saturations which are well below the optimal level. House dust mites prevail in every household and are living within dust, textile, carpets, beds and upholster furniture. The house dust not only provides a habitat for the mites, but also contains their food source: shed human skin scales which become colonized by molds, yeasts and bacteria. As a consequence of dusting, vacuuming and bed-making, the faecal pellets and smaller allergen – bearing particles become temporarily suspended in the air and may be inhaled by humans. People who are genetically predisposed for allergies, also known as atopic people, can react to these particles (allergens) with manifestation of allergic symptoms. Allergens are (non) protein or substances which can induce an allergic response. The symptoms of an allergic response are comprised of: sneezing, runny or stuffy nose, red, itchy or teary eyes, wheezing, coughing, tightness in the chest and shortness of breath and itching. Furthermore, previous studies show that dust mite allergy is an independent risk factor for development of asthma. Our main focus is the production of house dust mites (HDMs) and their allergens. Citeq was born based on a passion for mites and the research for how mites influence our daily lives. Our founders and leading scientists have pharmaceutical, biological and biochemical backgrounds. With over 25 years of experience and an extensive knowledge about mites Citeq is more than just a supplier of allergen source material. We strive for an academic collaboration with our customers in order to achieve the best possible results in research, diagnostics and immunotherapy. 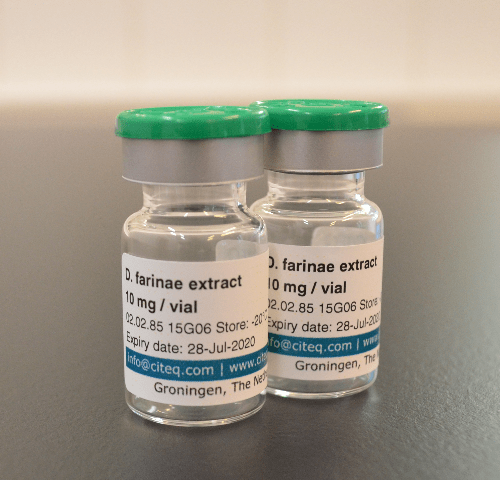 We deliver the D. pteronyssinus and D. farinae HDMs in different forms. 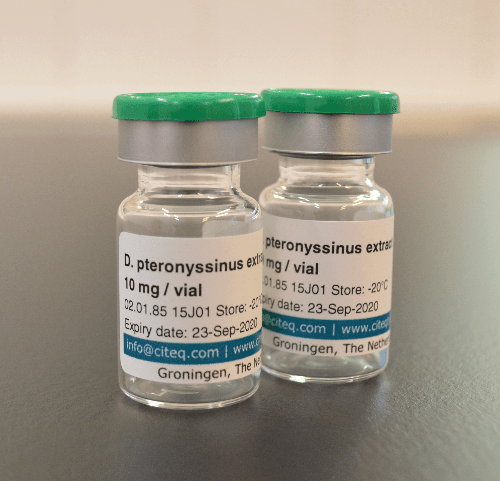 The most popular form is the regular HDM extract but we can also deliver whole cultures, purified allergens (Der p 1/ Der p 2, Der f 1/ Der f 2), excrements and mite bodies. In our production process we do not add any proteins. The only compound we use in our products which is not strictly from mites is the medium where the mites feed on. This medium contains an absolute low number of non-mite proteins. We try to cultivate the mites with the lowest amount of bacteria and moulds possible. 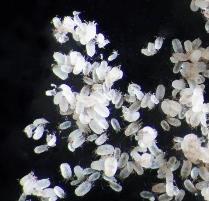 All our house dust mite products contain the native proteins, with no denaturing treatments during production and purification. Please click on the type of house dust mite that you are interested in for more information and the available forms. Each product will be delivered with a certificate of analysis. The certificate of analysis provides information, e.g. allergenic pattern, protein content (BCA and Bradford method), endotoxin level, protein pattern and protease activity. On this page you can find an an example of this certificate. If you want to receive a certificate of analysis before ordering please let us know. We shall send you the certificates of multiple batches so you can compare the batches and choose the batch that meets your requirements. We understand that if you are using source material which is fulfilling your wishes you would like to receive the same material again for future projects. To provide material from the same batch over a longer period of time we produce large batches. This way we have we a lot of material available from a specific batch. You can even place a reservation for future orders. Often we receive questions about house dust mite (HDM) induced asthma models. Which models are researchers using, which model do we recommend, what are the differences? To answer these questions we have contacted multiple research institutes all over the world and collected their models and background information. Click on this link for an overview of the available animal models. We deliver our products worldwide. Are you interested in ordering our products? Please contact us for a quotation and the actual delivery costs. You can contact us through info@citeq.com, +31(0)50-3137464 or fill in our contact form. You can also request a quotation through our website, just add the products you are interested in to the quotation request and we will send you a quotation with the shipping costs as soon as possible. We accept payments on account or you can pay by using your creditcard or PayPal account. Of course you can also send us your purchase orders on our e-mail address info@citeq.com. After receipt of your order we will send you an order confirmation with the expected delivery time.